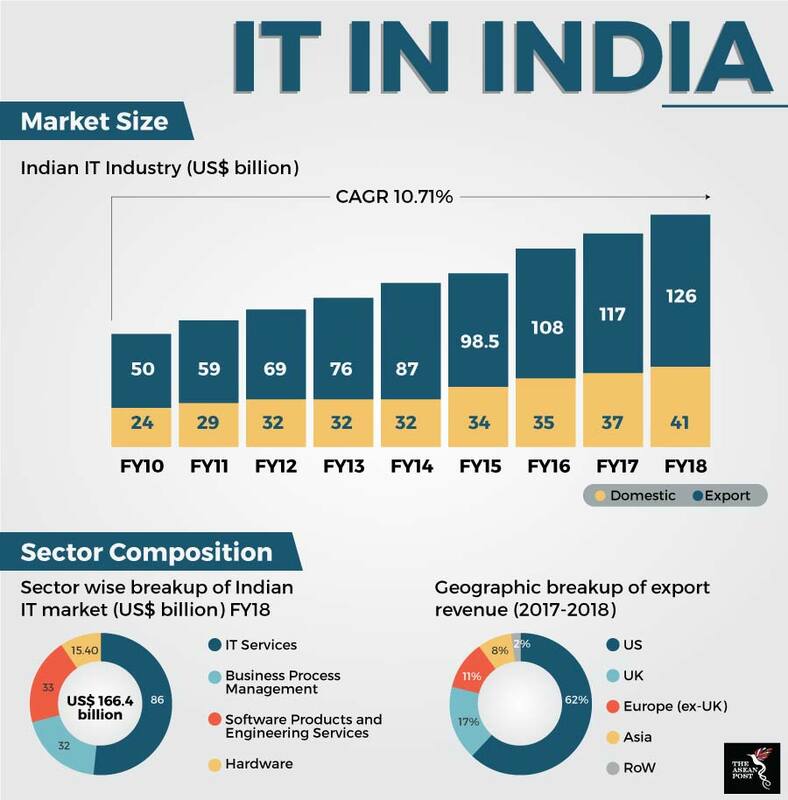 According to government statistics, the information technology (IT) sector accounts for 45 percent of India’s services exports and 9.3 percent of its nearly US$2.3 trillion gross domestic product (GDP). It is also the largest private sector employer, delivering more than three million jobs and represents 56 percent of the global outsourcing market. From the boardrooms to the engineers in tech giants like Google and Microsoft, Indian-born executives and engineers are commonplace. It’s no surprise then, that Indian IT is a renowned export and there is plenty that Southeast Asian states can learn from its experience. According to the World Economic Forum (WEF), the Association of Southeast Asian Nations (ASEAN) is on the precipice of a digital revolution that is set to transform the region by 2025. ASEAN’s young population would be a key driver of this push. ASEAN member states must ensure that tomorrow’s generation is equipped with the necessary skills to tackle these challenges. To take a leaf out of India’s book, the emphasis should be on the development of Social, Mobile, Analytics and Cloud (SMAC) skills. India aims to generate a workforce of more than 150,000 that is adept at SMAC skills. To further expand the pool of IT-enabled citizens, the government there is looking to develop a national fibre optic network which would connect more than 250,000 villages to the Internet. In doing so, rural potential is also tapped and the urban-rural divide can be bridged. The importance of a SMAC outlook is to ensure the workforce of the future is curated to be sensitive to modern-day demands. Businesses of tomorrow are no longer going to be reliant on traditional means of operation. Even today, start-ups and established companies are evolving to rely on social media for brand reach; developing mobile friendly user interfaces for consumers of their products, relying on big data analytics to improve efficiency of operations and shifting to more secure cloud computing to protect user data. As we inch closer to a digitalised ASEAN region, the demand for labour that work with such technologies will increase. Hence, member states must start cultivating this “future workforce” mindset in all strata of society – be it rural or urban – to reap the long-term benefits. In building such a workforce, the risk of a “brain drain” as citizens, equipped with these skills leave the country for greener pastures is a worrying factor. To bridge this problem, there must be adequate infrastructure development to undergird the digitalisation process. In India, infrastructure development for the IT sector is integral as the country has started to welcome back talent in what is termed as a “brain gain.” Granted that a lot of the motivating factors behind this influx is the global trend of negative perception of immigrants in foreign lands. Nevertheless, the Indian government has been adept at ensuring the talent that has returned is retained in the country. Bengaluru – India’s homegrown Silicon Valley is an example of an IT hub that is vastly developed and can provide the high paying jobs that these former employees of Google, Facebook, Microsoft and Apple once had. But Bengaluru is not alone in this game. Responding to the congestion in Bengaluru caused by the pressures of its huge IT sector, other cities in India like Chennai, Goa, Hyderabad and Pune have mushrooming IT sectors in need of talent influx. ASEAN member states face a similar predicament but on a regional level. If countries like the Philippines or Malaysia were to develop a SMAC workforce, the risk of a brain drain – particularly to Singapore, for its highly sophisticated IT and business infrastructure development – is a noticeable risk. Herein lies an opportunity, for member states to develop their own IT hubs to compete with Singapore. In doing so, it would elevate the region’s IT sector profile and provide more choices for ASEAN citizens looking for work in this sector. For example, Malaysia has developed Cyberjaya as a start-up hub for the region and Jakarta is fast becoming a regional IT hub of the future. With the digital revolution upon us, ASEAN member states must begin to proactively develop their respective IT sectors or risk losing out. For those currently playing catch-up, looking to India for inspiration might just do the trick.